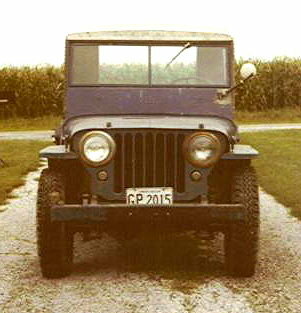 "Here's a couple photos of a 1947 CJ2A that I started working on a couple of months ago. My Dad bought it in 1975 from a neighbor. We don't know how long the neighbor had it. He had it at least in 1968, for I remember riding in it while deer hunting in Colorado. The master cylinder went bad and the radiator leaked so Dad parked it in the early 80s, figuring he'd get to it some day to get it going again. It's been a farm Willys. Always garaged. Body is in pretty decent shape. A bit of rust on the driver's side floor board and on the passenger side step. 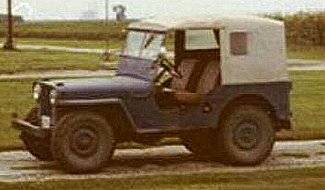 The engine was replaced with a "Jasper" Jeep L-134 about 1970. After sitting for 15-20 yrs it still runs like new. Oil pressure runs at 50-55 psi. The top is an aluminum "Blue Star" make. The original color was black but the previous owner painted it the blue - with a brush. Seats have been replaced. Still have some work to do on it but it's coming along."